April has come and gone – hopefully with it so has the rainy cold weather to make way for May flowers. April also brought a very important time of year for Surgical Health Policy Advocacy. 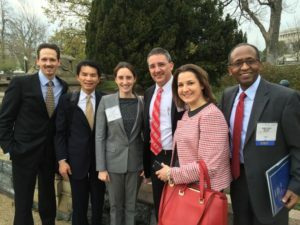 The American College of Surgeons held the annual Leadership and Advocacy Summit in Washington DC from April 9-12. The Leadership portion of the Summit was an opportunity to delve into timely leadership areas. This year’s agenda included: communication and teamwork, strategic thinking, engagement and sustainability, role of social media and emotional intelligence. Also highlighted were various state chapter reports, presentations from Adil Haider MD, FACS on disparities in surgical care, David Rogers MD, FACS discussing team conflict, and much more. Collage leadership present included Patricia Turner, MD, FACS, Director of Division of Member Services and David Hoyt, MD, FACS, Executive Director. The Advocacy portion of the Summit began Sunday evening with Keynote speaker ChrisMatthews of MSNBC’s Hardball. Christian Shalgian, Director of Division of Advocacy and Health Policy, Frank Opelka, MD, FACS Medical Director of Quality and Health Policy and Patrick Bailey MD, FACS, Medical Director of Advocacy also attended this portion of the summit. Monday was filled with Advocacy instruction and state breakout and networking sessions followed by lobby and issues briefings to prepare for Lobby Day on Capitol Hill. The lunch speaker was Larry Sabato an election analyst and author who gave a stimulating perspective on the lively presidential election race and contrasted with Chris Matthews in a number of ways. Topics discussed with legislators during Capitol Hill visits on Tuesday April, 12th included: ensuring adequate surgical workforce in underserved areas, reinforcing the importance of support for Graduate Medical Education, Removing Billing Barriers of Colorectal screening colonoscopies, support of cancer initiatives, responsible use of CMS data by public reporting agencies, and trauma funding. Additionally, surgeons discussed with their legislators and legislative staff MACRA and MIPS implementation. Attendees from the WSS included: Michael Garren, MD, FACS (WSS President), Amy E. Liepert, MD, FACS (WSS Policy Chair), Charles Chang MD, FACS (Thedacare), Girma Tefera, MD, FACS, (ACS Operation Giving Back Medical Director), Rachel Morris, MD (MCW Resident), and Moritz Wyler von Ballmoos, MD (MCW CT Fellow). 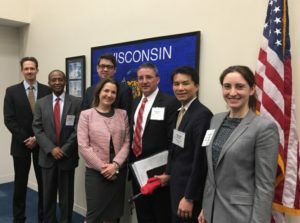 Legislative offices visited by this group included: Speaker Paul Ryan, Senator Tammy Baldwin, Senator Ron Johnson, Representative Mark Pocan, and Representative Gwen Moore. 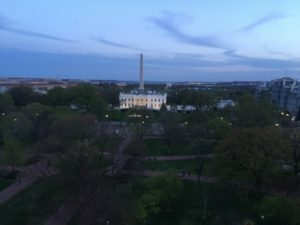 The Leadership and Advocacy Summit is a yearly meeting held in Washington DC. In addition to being informative of current and timely legislative agenda items impacting surgeons, it also provides numerous venues for networking. The 2017 Summit will be held May 6-9th at the Renaissance Hotel in Washington DC. Additional advocacy info will be available via this blog and at www.surgeonsvoice.org.